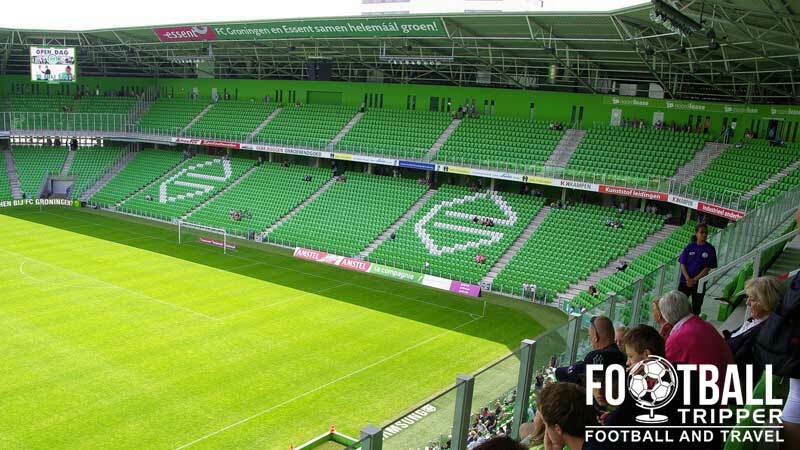 Euroborg has been the home stadium of local football team FC Groningen since opening in 2006. Located towards the south-east of the city, the 22,329 capacity ground features distinctive green seats which reflects the club’s traditional colours. In 2013 a permanent railway station opened allowing fans easier access to the stadium. 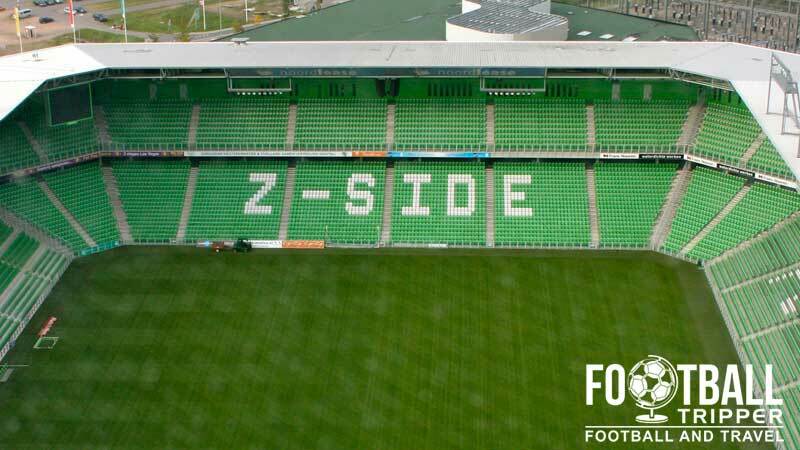 Plans to relocate FC Groningen away from Oosterparkstadion were formulated in latter half of the 1990s when the club believed that the standard of their stadium was beginning to fall behind those of other teams across the Netherlands, particularly with UEFA’s increasingly stringent safety legislation and preference for seating after a series of high-profile incidents such as Heysel in the preceding decade. The actual physical construction work took place between 2004-2005 but it took at least a decade to successfully get local businesses on board to invest in the wider business and retail complex (Europa Park) which Euroborg stadium was set to be at the heart of. Seen as crucial to generating the requisite finance, numerous redesigns of the stadium took place delaying the project due to the ever changing budget the designers Wiel Arets had to work with. For example, the stadium was initially envisioned with a retractable roof but by the time the inaugural match was held against rivals SC Heerenveen on the 13th January 2006, a standard and more affordable design was favoured. The stadium currently consists of two tiers, with the club stating that there is the possibility of adding a third ring which will increase the capacity to over 33,000 although this wouldn’t be large enough for the World Cup and thus wasn’t considered as part of the country’s 2018 bid. As well construction taking longer than expected due to a defective concrete casting machine, Euroborg stadium suffered further bad luck when a small fire broke out in the North stand during a 2008 match against Ajax. Whilst no permanent damage was done to the ground, 28 spectators were taken to hospital although there were no fatalities. Euroborg Stadion is comprised of four stands: North, East, South and West. Away fans or “Gastenvakken” are usually housed within the south-east corner of Euroborg within sections O, P and Q. The seating extends across both tiers of seating and is marked out by a small section of fencing, with views of the pitch decent throughout. You can access Gate 3 where the seats are from Gideonweg and the bridge over Oude Stramspoor or simply take the main Boumaboulevard and then walk around the stadium. Although this map doesn’t suggest it, there are plenty of pubs in the city centre, and at the stadium there is the Hattrick bar for home supporters. 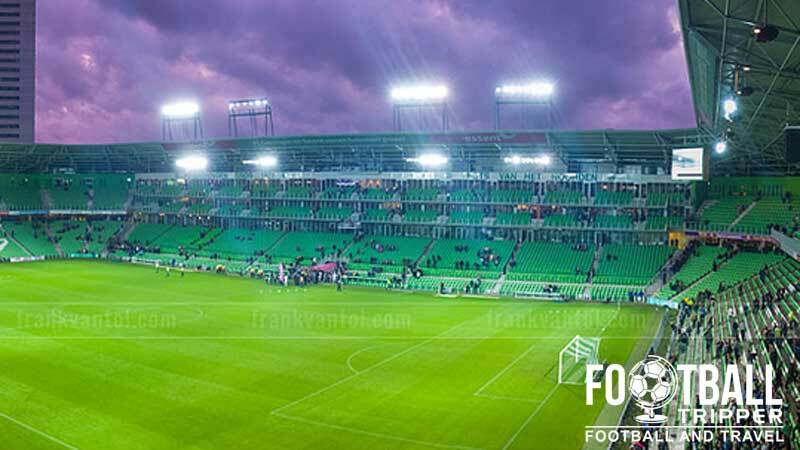 FC Groningen operate a fanshop known as the Fan Corner along Boumaboulevard, and with the exception of the club’s online store, it is hands down the best place to purchase official merchandise for “The Pride of the North”. Inside look at one of FC Groningen’s fan shops at the stadium. The shop is 4oo m2, spans two floors, and is wall to wall green. Stadium tours of Euroborg are usually conducted on Wednesdays at 4.30 pm each week providing there is enough people interested, and cost €9.00 for adults, €7.50 for children. Fully-guided my knowledgeable members of staff, the tour lasts around 90 minutes and takes in all the special areas including players’ tunnel and dressing room. For more information or to book your place on the tour you can either send an email to [email protected] or complete this form on the website. 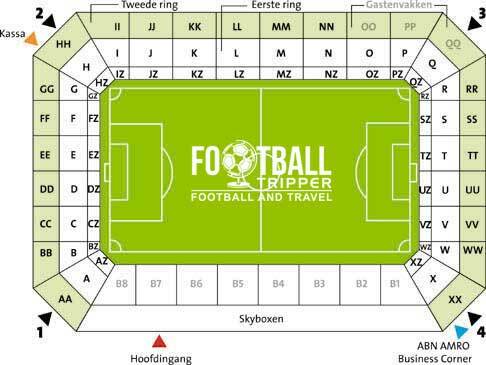 Tickets usually go on sale to the general public two weeks before the event on the nearest Friday from 9.00 pm onwards, and can either be purchased online, at the club’s shop – Fan Corner Groningen or since March 2015 from over 33 retailers around the city. Note: There is a price increase of around three euros for high-profile matches against Ajax, AZ, PSV, FC Twente, Heerenveen and Feyenoord. 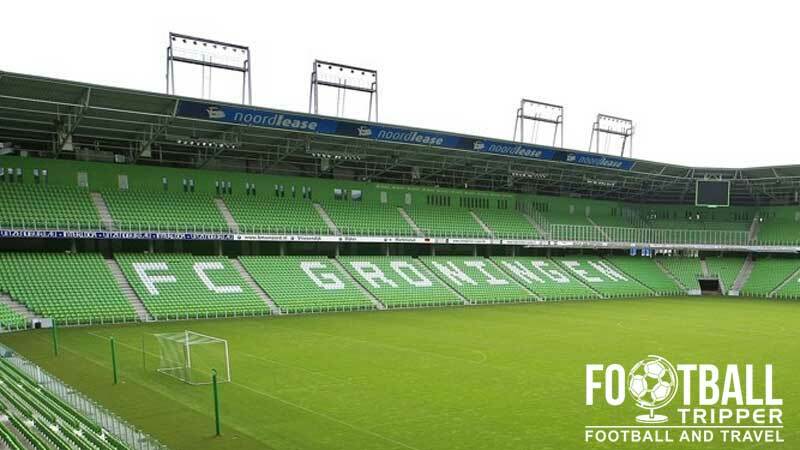 Stadion Euroborg sits just over 2.5 km from Groningen’s historic city centre which means that it can be walked to a very convenient 30 minutes or so. Situated within an out of town business park, it’s still highly accessible from the city centre unlike a lot of other modern stadia. Stadion Euroborg’s exterior blends in seamlessly with the surrounding environment although perhaps this is due to the lightning when the picture was taken! The stadium is served by its own train station known as Groningen Europapark. You an catch trains from Groningen’s Main railway station to the Euroborg in just over 2 minutes for a couple of euros which explains its popularity on matchdays. The bus stop just north of the stadium on Boumaboulevard is served by bus numbers 5, 12, and 73 with the number 5 departing from Grote Markt Square in the centre of Groningen. Car Park 1 at the stadium costs €1.50 per hour, and car park 2 costs €5.00 for the duration of the match and the time either side of this. Both parking lots are well signposted upon arrival at the stadium with stewards usually on hands to direct you to vacant spaces. A parking sign for Stadion Euroborg. Groningen Airport Eelde is located 10km south of the city centre, and is served by a number of low-cost airlines including Wizz Air, Transavia and Flybe which flies out of London-Southend. Upon landing you can travel into the city in just under 40 minutes by catching Bus number 2 which runs twice hourly during the day. It cost €5.00 for a single, and is probably the easiest way unless you plan on renting a car or getting a taxi. There is the Euroborg Horeca stadium at the stadium, however it is expensive and difficult to book compared to the other accommodation options back in Groningen city centre. You will find a good range of hotels here north of the Eemskanaal Noordzijde such as Hampshire Hotel, The Martini and Hotel De Doelan.